When I was discussing with our pediatrician regarding baby's first food, she recommended rice cereal / rice porridge because it's easy to digest and less likely to cause any allergic reaction. Moreover as rice is most commonly eaten in India, she recommends starting with diluted rice kanji. Again the standard advise is to exclusively breastfeed your baby until 6 months. 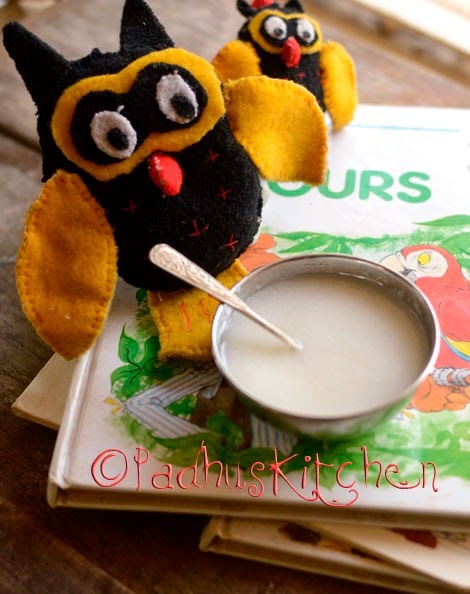 Today we will see how to make homemade arisi kanji/rice porridge for babies following our easy recipes. Important- Initially when you introduce rice porridge to your baby, give it a little diluted or thin for a week. This thin porridge can be given in feeding bottle itself. Once the baby is comfortable with it and has no allergic reaction, you can give a slightly thick (saucy consistency as in the picture) rice porridge. Use a baby spoon to feed your baby. Follow the standard instructions like sterilizing the utensils, bottles, washing your hands etc. Always consult your pediatrician before starting any new food for babies. Wash rice well, drain the water and dry it well in the shade/sun. Dry roast par boiled rice until it is hot to touch. Switch off the flame and dry roast carom seeds in the heat of the pan itself. Let it cool. Take 2 tsp of rice porridge powder, add 1 cup of water and mix well without lumps. Cook on low flame until it reaches a saucy consistency. Leave it to cool. Feed warm with a baby spoon. Discard leftovers. Once the baby is comfortable with the first rice porridge, you can gradually shift to the second recipe. Wash rice and drain the water well. Dry it well in the shade/sun. Dry roast rice and dal (split yellow moong dal) separately until it is hot to touch.Transfer it to a plate to cool. Dry roast carmon seed in the heat of the pan itself just for 2 seconds. Powder all the three together finely in a blender or mixie. Store it in an air tight container and use when required. Do not add salt or sugar to the porridge. Could you please tell me how to prepare kanji with different type of millets..
We assume that babies will like it only if we add salt and sugar. It is not so. According to Babycenter.co.uk- Babies need only a very small amount of salt: less than 1g (0.4g sodium) a day until they are 12 months. Your baby’s kidneys can’t cope with more salt than this. Thanks a lot for liking my recipes. You can make it a fine powder. If you cannot, then cook well adding more water and mash it nicely. You can buy any brand but make sure that it is extra virgin pure coconut oil. You will get it online or in health stores. Hi padhu- your receipes are awesome a quick question on the coconut oils addition.. should it be added after cooking or before? Can I use raw rice ( pacha arisi) instead as we use for ourselves . We use par boiled rice as it is easily digestible for the babies. Thank you dear Padhu. Can I pressure cook instead. You can pressure cook by keeping it in a vessel inside the cooker. How long can we store this rice porridge powder once prepared. Can we prepare in bulk and store it as I will not be able to dry it completely at my place.. Since you are dry roasting it, it will not get spoiled but I suggest that you prepare in less quantity as it is for babies. Ajwain is added as it helps in digestion. Can I use normal rice which we eat and it is necessary to add ajwain? Normal par boiled rice used for regular cooking. It is not necessary to add ajwain but it helps in digestion. I am not sure. Kindly consult your pediatrician. One doubt. Do v hav to grind it into a power lik atta or a bit granular lik rava. You have to powder it finely. Is it ok to giv it in the mill??? I dono y i cannot grind it into a fine powder. In the mill, they powder a minimum of 1 kg. If you will use that rice for any other purpose, you can grind it in the mill or it is better to grind in mixie and sieve it. Hi.. I am srividya.. I prepared rice ganji using ur recipie it turned out awesome n my six months little one is enjoying like anything... Thanks... I had a controversy in smashing the sadam or blending it ie.. Prepared rice.my lo had problems in digesting that.. Ur ganji idea is like boon to me. Can I use basmati rice for making porridge? I have used par boiled rice as it is easily digestible. It is not advisable for infants. Hi... can we add coconut milk instead of coconut oil if baby s underweight? Can we give without adding carrom (omam)? My mom saying medicine smell may come. Can you suggests only by adding carrom its easy for digestion! Yes, you can omit that if you do not prefer. Can we use other dal instead of moong for 7 month baby if so what dal we can use? It is preferable to use moong dal as it is easily digestible than other dals. Dry roast on medium heat stirring continuously until you get the aroma of roasted dal. Dear Ms Padhu, I found your blog interesting. We wished to make neer dosa/ Kori roti on a slate stone tawa. We got hold of the slate stone tawa in Sullia in Dakshin Kannada district. How do we condition the slate stone tawa? There is no information on the net. Thanks for your tips Padhu! Can we use idli arisi instead of saapadu puzhungal arisi as idli arisi is also par boiled? Let me know, thanks! Dear madam, I like all your recipies specially made for kids. While roasting dal it turned black ( little) can i still use to make powder? Kindly suggest.. Thank you for liking my recipes. If possible discard the black dal and use it as it is for baby. Consult your pediatrician before starting or giving any new food to babies.